Our Double Queen Glamping Tent is a 16' x 22' canvas wall tent set on stained concrete with in-floor heat. This is glamorous camping to be sure! The two queen size beds include luxury linens and a down duvet. 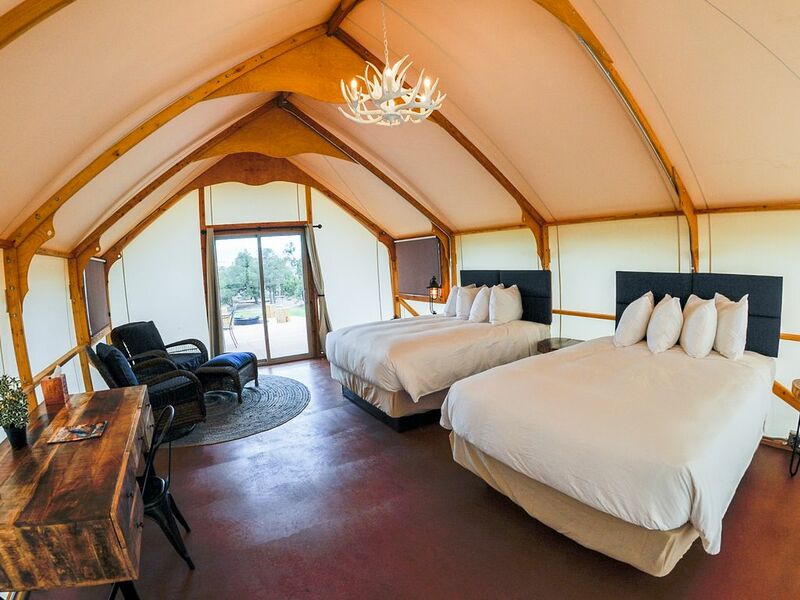 Glamping tents include a desk, night stands, a seating/living area, wireless internet, multiple power outlets, and designer bath products for use in the community shower house just steps away from your tent. Each tent also includes a private concrete patio with campfire ring and outdoor seating and table. Every night a fire will be prepared for you so all you have to do is strike a match and enjoy your crackling fire under a starry Colorado sky. Double Queen Glamping Tents have a maximum occupancy of 4 adults. Bathroom is located in shared shower house. Evaporative cooler, or 'swamp cooler' in each glamping tent. An outdoor table and chairs are available for dining. Thank you for your kind review! I'm so glad that you enjoyed your Glamping experience with us! We appreciate your feedback. The suggestions that you've made are very well thought out. We will keep these ideas in mind for future growth. Thank you for staying with us and we hope to see you again!